Please make sure you have upgraded the firmware to the latest version first, including any extra updates (including voice and panel updates as per the firmware installation instructions), and installed the correct Korg MIDI driver for your system. After downloading DirtBoxSynth custom content, unzip them to access the PRLGUNIT files. Open the librarian while the keyboard is connected. As soon as the synth is recognised, it should transfer the existing patches and user data from the Prologue to the librarian automatically. If you get any warning that it failed, check the firmware and MIDI driver as above. 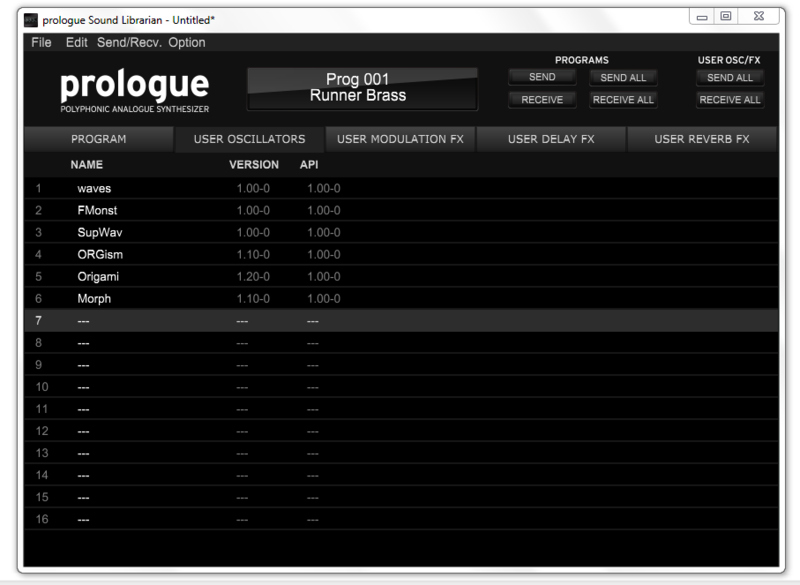 If you are loading an oscillator, click on the USER OSCILLATORS tab, and drag the unzipped oscillator to an empty slot. Likewise, if you are loading an effect, click on the relevant tab (mod / rev / delay), and drag to those empty slots. To transfer to the keyboard click ‘SEND ALL’ under ‘User Osc/FX’ in the top right of the librarian. This will load the custom files into your Prologue, and will be available in the relevant oscillator or effects sections. Please note: any oscillator presets that are made, rely on the slot position of the oscillator. So, if you move an oscillator to a different slot, any presets that were previously saved will not work as expected. To call up a custom oscillator, switch the wave selection switch in the digital oscillator section to USR, and scroll the TYPE dial until the display shows the oscillator you wish to use. The ‘hands-on’ controls are SHAPE, and SHAPE whilst holding Shift (or SHIFT_SHAPE). The remaining six controls can be found in PROGRAM EDIT MODE. Pressing the EDIT button scrolls through the six parameters. To edit the value, turn the PROGRAM/VALUE dial. Parameter lists for each oscillator can be found on the product pages. Visit the DirtBoxSynth shop for all available custom Prologue content. To select a custom MOD EFFECT, toggle the select switch to scroll through effect types until the USER type is selected. Press PRGM EDIT and select User Type. The specific custom effect can then be selected with the PROGRAM/VALUE dial. Once selected, the only controls for the mod effect are SPEED and DEPTH, although they will often be assigned to different actual parameters (eg. cutoff frequency and resonance). Choose either Delay or Reverb with the toggle switch. Press PROGRAM EDIT to select Delay Type or Reverb Type as appropriate, turn the PROGRAM/VALUE dial to select the type of effect you want. Any custom effects can be found after the in-built effects. The two controls for Delay or Reverb effects are TIME and DEPTH, but may be assigned to other actual parameters.